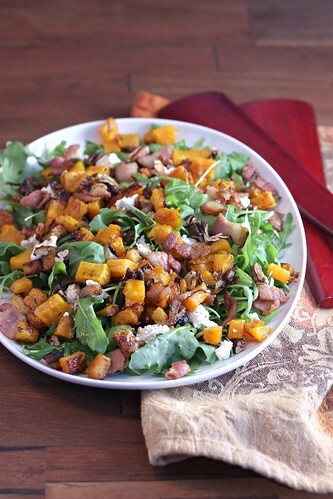 Roasted Squash and Arugula Salad with Bacon, Pecans, and Goat Cheese – Elly Says Opa! Hi there. Allow me to introduce you to your new favorite salad for this time of year. You should totally make this for Thanksgiving. Everyone knows Thanksgiving is all about the side dishes since the protein of choice, turkey, is subpar at best. This salad has it all. Slightly spicy arugula? Check. Caramelized butternut squash? You bet. Smoky bacon? Duh. Creamy goat cheese? Ding ding ding. Toasty pecans? Yes sir. Seriously, I cannot sing this salad’s praises highly enough. I do love salad, don’t get me wrong, but it’s rare that they are my favorite part of a meal. We had this alongside a simple roasted chicken – which is, indeed, one of my all time favorite meals – and this salad stole the show. I…don’t have much more to say other than go make this, likerightnow. Preheat the oven to 375º. Spread the pecans on a baking pan and toast in the oven until fragrant, about 7-8 minutes. Set aside in a bowl to cool (keep the baking pan around). Increase the oven temperature to 425º. Meanwhile, peel, seed, and dice the squash. Toss with the olive oil and thyme on the empty baking pan and roast until tender and browned around the sides and edges, stirring 1-2 times in the process, about 25 minutes. While the squash roasts, fry the bacon. When the pieces have rendered their fat, remove with a slotted spoon and place on a paper-towel lined plate, keeping the bacon fat in the pan. Add the shallots to the pan and saute until softened. Stir in the vinegar and season to taste (if you are using particularly lean bacon, you may want to add some olive oil). 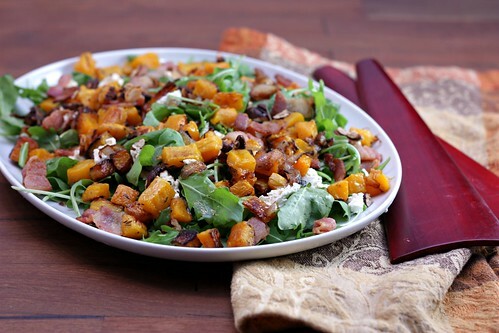 Toss the arugula, squash, 3/4 of the bacon, 3/4 of the pecans and 3/4 of the goat cheese along with the vinegar mixture. Plate, and then sprinkle with the remaining bacon, pecans, and goat cheese.